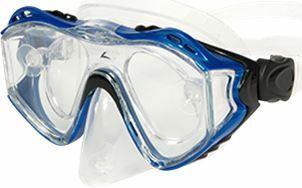 Prescription Dive Mask Versatile, lightweight Prescription Dive Masks with an exceptional field of vision. Suitable for either snorkeling or diving. We place your exact prescription - including cyl correction for astigmatism - in the Rx insert that sits inside the Prescription Dive Mask. Allow 3 business day for production before we ship to you. Versatile, lightweight Prescription Dive Masks with an exceptional field of vision. Suitable for either snorkeling or diving. Thanks for making my vacation the best! Thanks for the great job and service on my prescription snorkel goggles. This was my first experience of actually being able to see underwater! For over 50 years I have missed out on this treat! I got a underwater camera for Christmas and it would have been useless without my new goggles! Thanks Again! Adult mask fits most adults. Not sure what size to select? Order "frame for trail fit"in the lens options. We will include a return label. You will be charged the price of the frame. Contact us after the trial and we will place your prescription in another frame to speed your order and charge you the price of the lenses. starting at $79.95 for polycarbonate safety lenses. We need the PD or pupil distance in order to produce the lenses for your new glasses. You can obtain the PD from where you purchased your last glasses. PD can be 1, 2 or 4 numbers depending on how it was measured. If you are unable to obtain your PD, we can email you directions on how to measure it. If you are unsure on how to enter your prescription, you can attach a file copy to your order, or fax it to us at 866-800-8809. Be sure to include the PD - pupil distance. Sphere = Power of the lens - nearsighted + farsighted. Sphere will always indicate a + or -. Cyl = Correction for Astigmatism. Cyl will also indicate a + or -. ADD = Correction for near vision used in Bifocals, Progressive and Computer Glasses It will be a + number. Prism = Corrects image imbalance. The number will be followed by BI, BO, BU, BD to indicate the direction of the prism. Although sports eyewear is designed to offer the best possible protection during certain sporting activities, there is always the possibility that the wearer may sustain an eye, face, or other injury due to impact or because of the nature of the athletic activity. If the frame incurs an severe impact it must be replaced. If the frame is neglected or misused, or is worn improperly, the degree of eye protection provided may be reduced and may result in permanent eye, face, head, or other injuries. Neither the designer, manufacturer, nor GoodGlasses. claims their sports eyewear is unbreakable or eliminates the possibility of injury.